The Fredericks Company offers comprehensive technical services and support for OEM manufacturers looking to develop sophisticated glass components. Whether it is glass pinch or press stems with metal leads, glass-to-metal feedthroughs or custom tubulations with metal flares or flanges, The Fredericks Company will provide you with the highest quality precision product with vacuum-tight seals. 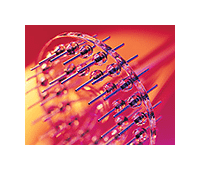 Our products have been used to support numerous applications including cathode ray tubes, x-ray tube image intensifiers, laser and infrared detectors, photomultipliers, and evacuation and getter-firing electron and power tubes. Whatever glass-to-metal design you have, contact our glass engineering specialists for an appraisal and determination of how we can address your needs.